When it comes to curry, Zaap serves true Thai options that cater to all. Every Monday, you can indulge in a beautifully cooked curry with a selected Thai beer or soft drink for only £10 per person. Book online for free text confirmation or call . 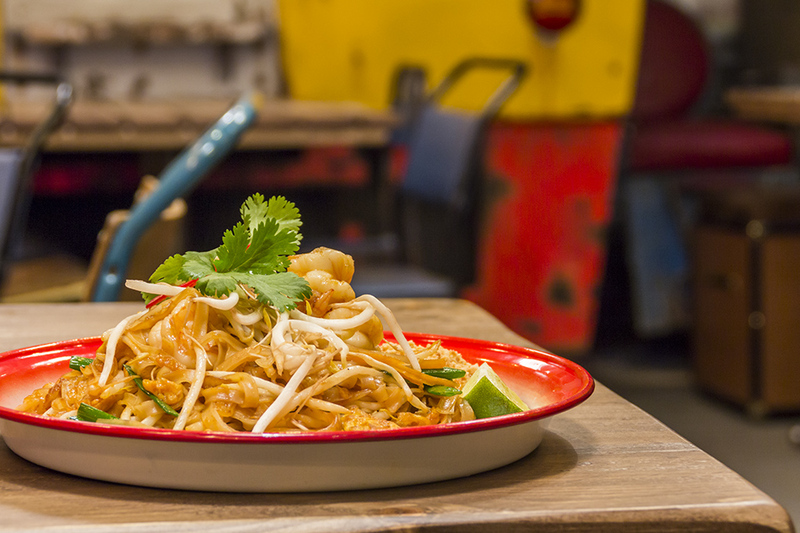 Join Zaap on Tuesdays for a delicious pad Thai treat, cooked fresh and served with a selected Thai beer or soft drink for only £10 per person. Book online for free text confirmation or call . 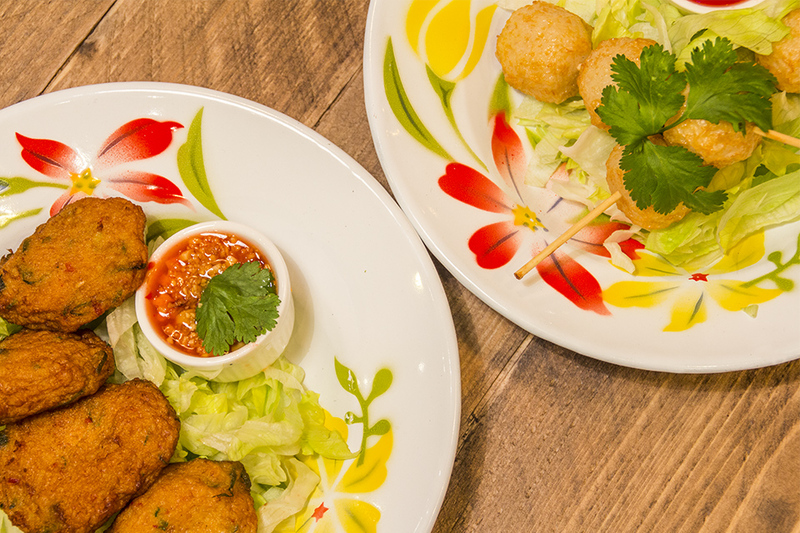 Tuck into a delicious taste of Bangkok with Zaaps' two-course weekday treat for only £10 per person. This offer is available Monday to Friday from 11 am to 6 pm. Book online for free text confirmation or call . 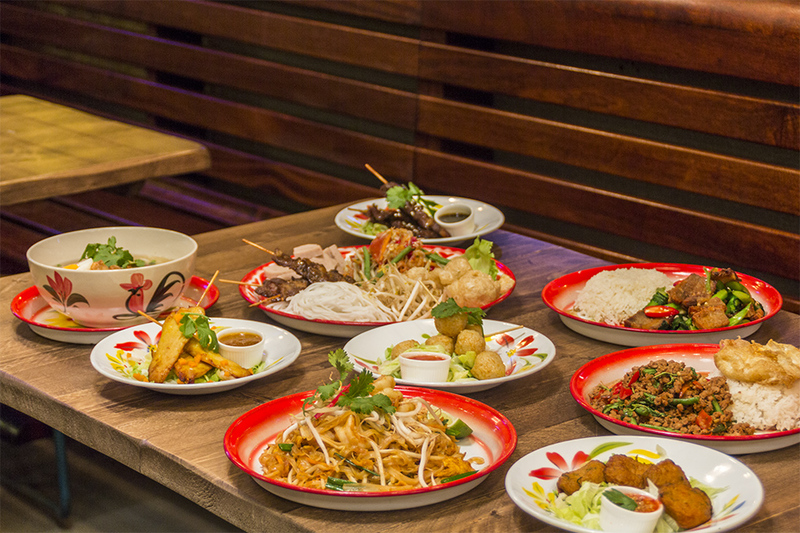 Tuck into a delicious taste of Bangkok with Zaaps' three -course weekday treat for only £12.95 per person. This offer is available Monday to Friday from 11 am to 6 pm. Book online for free text confirmation or call . Students rejoice! Zaap is offering you a 10% discount off your food bill every week from Monday to Thursday. Please note: this discount cannot be used in conjunction with other offers. Book online for free text confirmation or call . 2-4-£10 Happy Hour @ Zaap! ZAAPY Hour is Sunday-Thursday from 11am-6pm, available when you order 2 of the same drink. Book online for free text confirmation or call . £4.95 - New Kid's Menu! Zaap's Kid's Menu has arrived! Children can enjoy a main meal for £4.95, with chips and rice noodles available at £2.50 each. Book online for free text confirmation or call . The food was delicious, fresh and was just like eating street food in Thailand along with all the decor. The staff were really friendly and accommodating as we had arrived 10 mins late for our booking. Our waitress was really lovely and recommended some dishes to try which were great recommendations as our food was delicious! Thank you for a lovely evening full of great food and buzzing atmosphere, we will be back for sure. A bustling and authentic feeling restaurant with super helpful service and delicious food. Lovely food. Excellent service. Very reasonably priced. Will definitely return. The Zaap experience was amazing totally worth the money the food was great so delicious the venue was as people had commented was like being in Thailand we will definitely be going again. Just back from Zaap Nottingham for my wife's birthday and I have to say I was very impressed with everything. Food was awesome service was good and the place itself was just like a little bit of Bangkok, would definitely go again its worth the visit we traveled 17 miles to get here and SPOT ON! Good service. Good value for money. Really good food, although portions could have been slightly bigger , definitely return at some point. Food was lovely, Services was a little slow and the waitress was not aware that we had booked a table for 16 people. 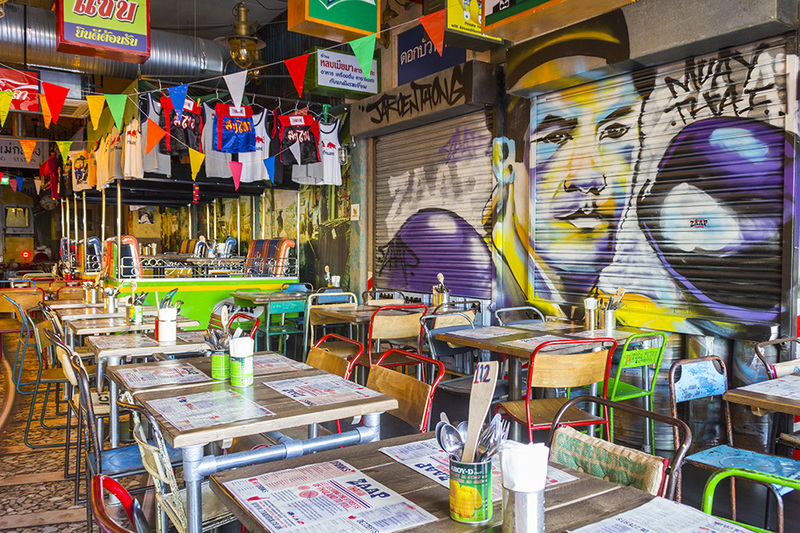 Delicious food, authentic ambience and a fun atmosphere! Great location for large groups. Great place to take children especially for birthdays as the staff sing Happy Birthday! Fantastic meal - food as normal was delicious, service was fantastic and staff are so friendly, could not recommend this place any higher. We travel from Belfast to nottingham every year for the ice hockey playoffs and always visit zaap. Love the fresh authentic Thai food served here and hubby loves Chang we can't get it back home, Roll on next year, wish they'd open one in Belfast. A lovely meal together with family. great food and brilliant staff. Excellent food and ambience, service was great! Really enjoyed the experience and staff sang to drum beat for my sons birthday, which was great. Will go again. Great restaurant lovely atmosphere and fabulous food. Lots of choice, food always fresh and good value. Great food in a fantastic setting. Really lovely meal out. Has helped the children be more adventurous. Excellent range of food. Very busy so service was a little hit and miss. Pretty good value for money. Will definitely visit again. Very tasty food and good service! Great service, atmosphere and food. Looking forward to my next visit already . Good busy atmosphere table booked for a while but by the door so chilly. Service was poor, loads of staff but no one came to order drinks had to ask 3 times. Food OK, ordered platters bit small for 2 and for the price £10. My main of belly pork was unremarkable but others in my group had chosen better and really enjoyed there's. Probably wouldn't return. Fantastic food and the atmosphere was buzzing. Truly enjoyed it. Thank you!!! Great atmosphere and fantastic aroma as you walk in. All my friends really love it and will be bringing more friends along to try out the extensive menu. Although I did think there could be a bit more noodles in our dishes. Excellent and enjoyed by the whole party! Grilled fish of the day in lemon and chilli broth was outstanding! I’ve been several times and the food and service have been excellent every time. It’s great value for money and the surroundings are lovely. Brilliant place to visit, quirky decor with tuk-tuks, some you can even dine in!! food was very good as well. Great food, service and ambiance for a good price. Would highly recommend! Our second visit as the first one was amazing. Disappointed this time though. We had the same starter but it wasn't as tasty and not very hot, we had different mains and they seemed to lack flavour. We all had leftovers ... shame as I'm now reluctant to go back. We sat down at 4.30 and the restaurant was relatively quiet so may be it's better later when the kitchen is busier and the food it fresher? Very nice food and good service. Wish we had tried something a little different though.... always next time. Loved Zapp, food was amazing as always, will definitely be returning. Exciting, fun place, with great food. If you haven't been to Zaap yet, then you really should go! Really colourful and fun decor. Food is tasty and good value. It's the type of restaurant you can go to more often as it's well priced and has a great buzz. Without a doubt, Zaap is one of Nottingham's most popular restaurants right now! First time at Zaap, will definitely go again! The food was delicious and it felt as if we were on the streets of Thailand! Great meal, made to feel welcome by the team! Booked for 6 for a birthday treat. Seated promptly, venue relaxed and fun, ordered a range of starters to share which were delicious. We also shared the 6 main meals which gave opportunities to try a number of unusual dishes without committing. Soup was very spicy hot so glad this was shared. Overall excellent food, good service and would definitely recommend! Nothing we didn't like. Great food, great atmosphere, great service and fantastic value for money! Will definitely visit again! All very good. Staff very efficient and food good. They catered for our group of 14. All the food came out promptly, hot and very tasty! Would highly recommend this place! Great food at a very reasonable price! We were a party of 33. The service was terrific at Zaap for so many people. great authentic food with Thai tin plates and Thai politeness. The senior lady organised everything marvelously so we were all served a wide variety of dishes, 76 in all, swiftly and accurately. They got a good tip from us all. We will go again. Brilliant place, good service, food and atmosphere! Great tasty thai food. Just like being in Bangkok. Love Thai food and Zaap does not disappoint. 3rd time of eating here a day will be back soon. It was a really lovely experience at Zaap. Food was good and atmosphere fabulous. They made the evening by singing happy birthday to our granddaughter. Lovely time had by all! Really good food at Iberico, service and atmosphere! Would go again and highly recommend! Great atmosphere and attentive service at Zaap. Enjoyed our Xmas party there! Food could have been slightly more tastefull within the starters but the Mains were superb. 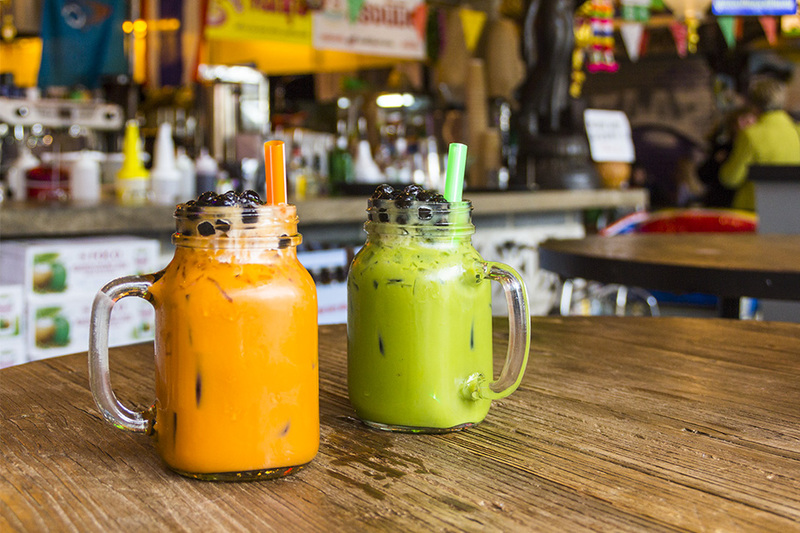 Zaap is a fun place with authentic Thai food if you follow advice of helpful staff. We thoroughly enjoyed our meal. I had to ask 3 times for a drink though but this was the only negative all evening other than this it was great. Excellent food, atmosphere and service throughout, highly recommended Zaap! Atmosphere, food, service and value for money all excellent! Just one slight criticism is that the serving staff, while polite, helpful and efficient were somewhat lacking in the smile department. Doesn't Thailand promote itself as "The land of smiles"? Great atmosphere, good value and quality tasty food - would go again. Having just come back from Thailand it was nice to see how authentic some of the dishes are here. Very busy as usual but seated us on time and the food came out rapidly. Took some friends for the first time and they were suitably impressed. The only negative thing I could say was that there were a lot of birthdays in and the celebrations by the staff are a little over the top and far too loud. Food and service excellent though. Look forward to going again soon. Such good fun and nice food! The servers were lovely! Myself and 10 family and friends visited Zaap last night and really enjoyed ourselves. The food was delicious and the decor great! The service was a bit chaotic, we waited over half an hour to order drinks and we were missing a few bits of our order but we did have a large party and it was a busy Saturday night. A little more understanding of food allergies would be appreciated too as we had a nut allergy within our party and despite explaining that more than once our chicken satay still came out with the peanut sauce! It was my birthday and I was serenaded in true Thai style by all the waitresses / waiters which was pretty special and for me made up for any issues. All the staff were welcoming and friendly and we definitely got service with a smile. All in all a great time had and all the amazing food devoured! I would definitely return, perhaps with a smaller party next time and probably not on a Saturday night. 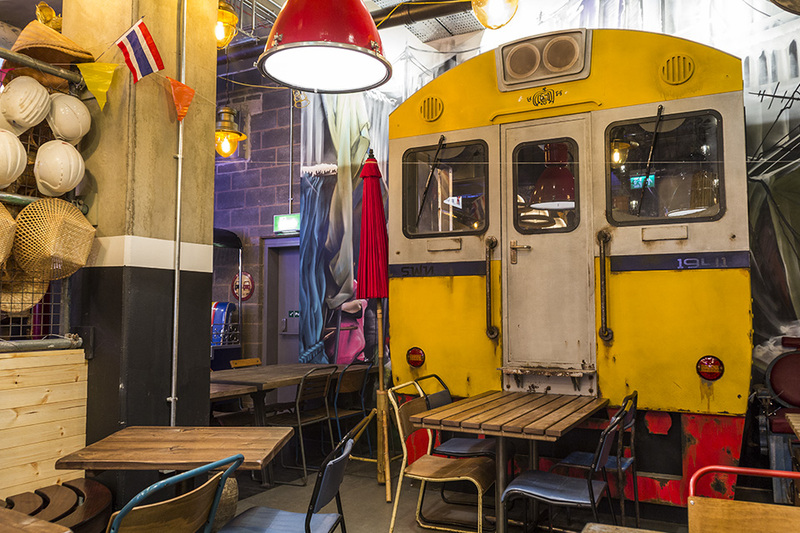 Recently opened on Bromley Place in the centre of Nottingham is the weird and wonderful Zaap Thai Street Food restaurant! 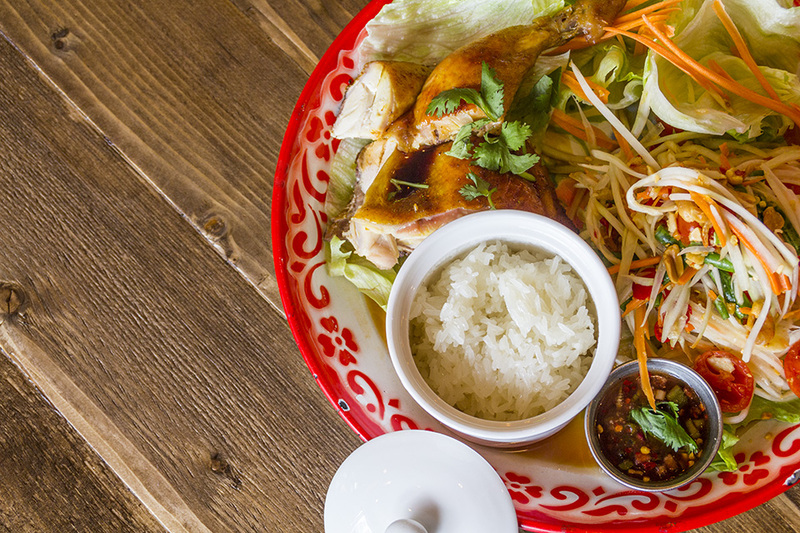 Bringing a small section of Bangkok all the way to the East Midlands, this brand new restaurant is the sister restaurant of the well-established original site in Leeds that has now made its way further south to Nottingham. Walking into the restaurant you will believe you have been well and truly whisked away to Thailand with the sights, sounds and smells of Bangkok. All the interior features of the restaurant were transported directly from Thailand, since the owners would settle for nothing less than a truly authentic experience for the diners. 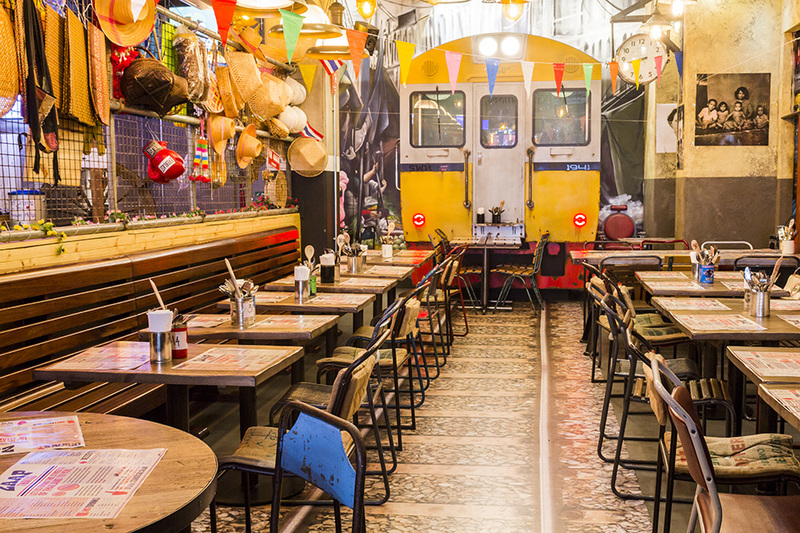 The bright colours of the interior are matched with real Tuk-Tuk bikes and a Thai train carriage, meaning a visit to Zaap is unlike any other restaurant experience! 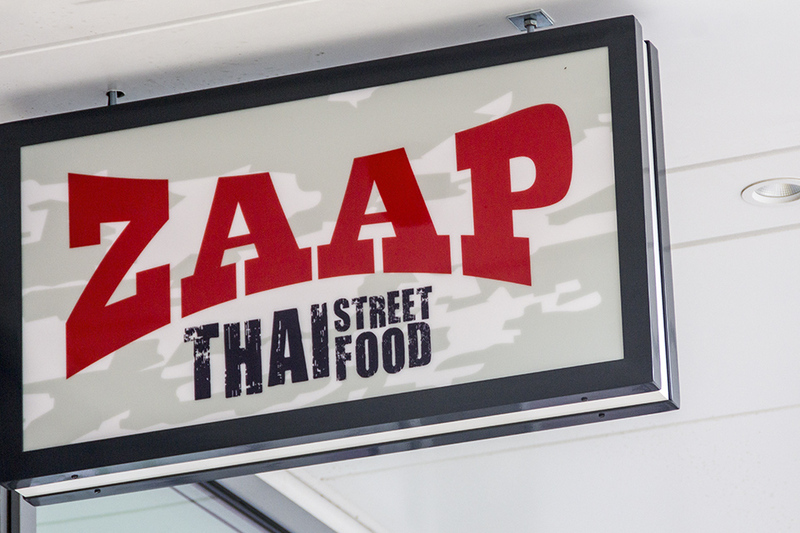 When it comes to the food, any true Thai food fanatic will understand the quality of the food served at Zaap! With many different options available there promises to be something for everyone. Cooked within an open kitchen at the centre of the restaurant you have the ability to watch your food prepared in front of your very eyes! From small snack starters and a pop-corn machine, to more substantial classic Pad Thai dishes or the Pla Pae Sa meal which comprises of the whole steamed fish of the day with Chinese leaves, chilli and coriander. For the vegetarians we would recommend the wonderful Pad See Aew: Stir Fried Rice Noodles in a dark and sweet soy sauce with egg, a recipe which originated from Malaysia and Singapore. To end your meal we would recommend you try some of Thailand's more traditional sweet dishes such as the Lod Chong Wat Je - a popular dessert from Indochina consisting of Jellied noodles made from rice flour, pandanus, juice and coconut milk served in palm sugar syrup and shaved ice. Students can enjoy a discount here. Please contact the restaurant for more information. 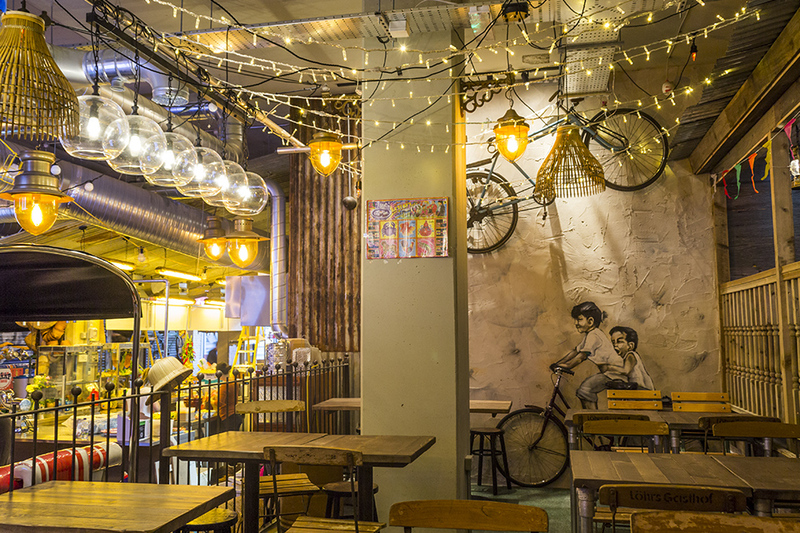 Zaap Nottingham is staying true to its Street Food roots and normally only accepts walk ins, however they will take bookings for larger groups and parties of over 8. Perfect for those wishing to throw a fun and relaxed lunch or dinner in the heart of Nottingham's bustling city centre. Mere steps from Nottingham's Market Square and not much further from the famous Castle, Zaap is perfectly located for visitors and Nottingham locals to enjoy. Papaya salad with raw blue crab (traditional style), ask our Zaapsters if you want it cooked! A traditional Isaan family eating style - papaya salad platter with pork sausage, rice noodle and mouth-watering condiments. The ultimate comforting Thai food you shouldn’t miss! Thai papaya salad with a choice of roasted chicken or grilled strips of pork on skewer, served with sticky rice. Great for sharing! Offer 7 Offers Available £10 - Curry Mondays £10 - Pad Thai Tuesdays £10 - 2-Course Weekday Treat £12.95 - 3-Course Weekday Treat 10% Student Discount! 2-4-£10 Happy Hour @ Zaap! £4.95 - New Kid's Menu! 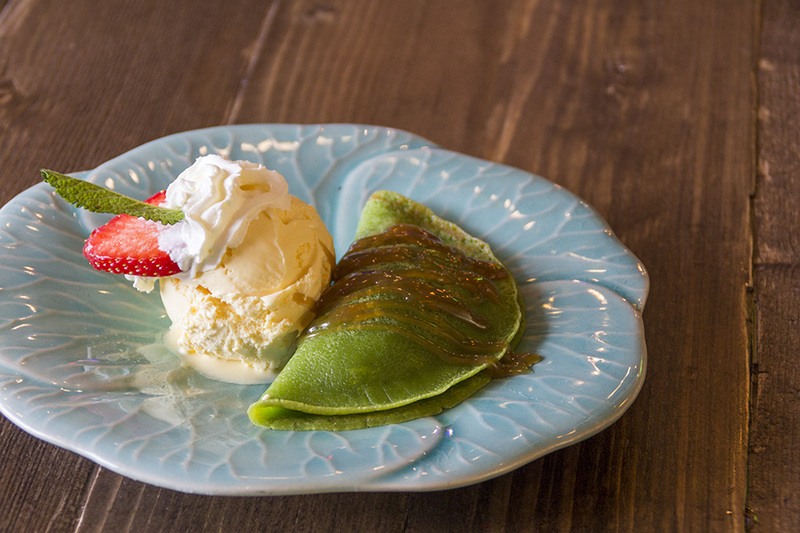 When it comes to curry, Zaap serves true Thai options that cater to all. Every Monday, you can indulge in a beautifully cooked curry with a selected Thai beer or soft drink for only £10 per person. Join Zaap on Tuesdays for a delicious pad Thai treat, cooked fresh and served with a selected Thai beer or soft drink for only £10 per person. 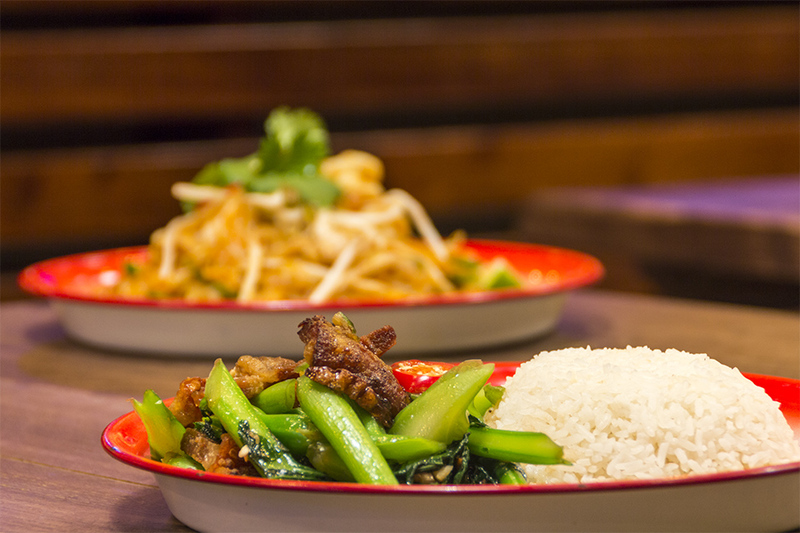 Tuck into a delicious taste of Bangkok with Zaaps' two-course weekday treat for only £10 per person. This offer is available Monday to Friday from 11 am to 6 pm. Tuck into a delicious taste of Bangkok with Zaaps' three -course weekday treat for only £12.95 per person. This offer is available Monday to Friday from 11 am to 6 pm. Students rejoice! Zaap is offering you a 10% discount off your food bill every week from Monday to Thursday. Please note: this discount cannot be used in conjunction with other offers. ZAAPY Hour is Sunday-Thursday from 11am-6pm, available when you order 2 of the same drink. Zaap's Kid's Menu has arrived! Children can enjoy a main meal for £4.95, with chips and rice noodles available at £2.50 each.